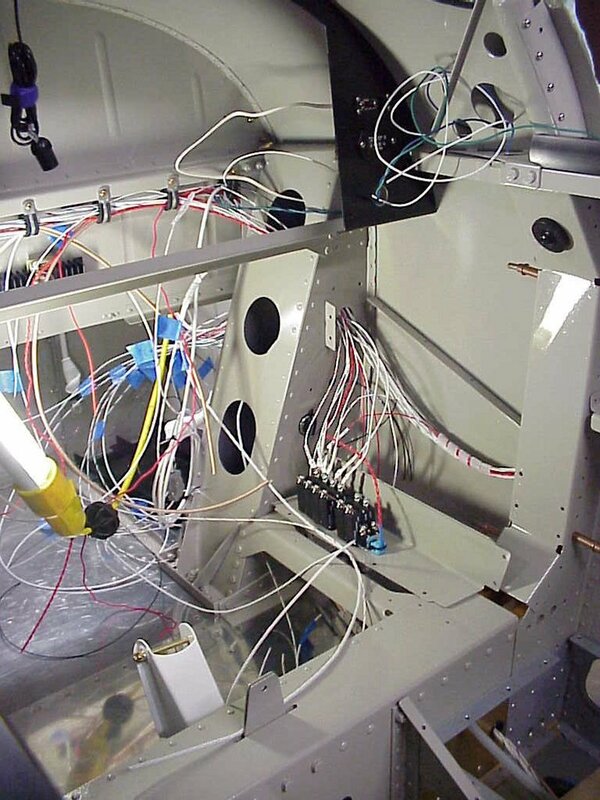 Of all the tasks and skills required in building an airplane, wiring is one of the things I like to do most — I've been looking forward to it the entire project. I've also been researching materials and techniques for some time now. In preparation I read Bob Nuckoll's book, the AeroElectric Connection, and attended his weekend seminar in Eugene, Oregon. I highly recommend this looseleaf book. Bob has a way of taking the fundamentals and relaying them in ways that are easily understandable. 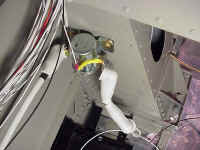 You can find out more about Bob as well as learn much about aircraft electrical systems from his web site at www.aeroelectric.com. Along with the pictures below I'll try to incorporate comments on some of the methods and techniques I've used. After I took my fuselage out of the jig and flipped it over I began to think about my battery installation since it was only a few steps down the road. I began hearing from builders who were flying their RV-8s with the same engine/prop combos I will be installing (O-360 A1A, Hartzell constant speed). All of them had gone with the standard firewall battery location. They were reporting that they were operating at the front edge of the CG envelope once they weighed everything. This was resulting in almost running out of elevator in the landing flare. Hmm. Now a forward CG loading is not altogether bad. 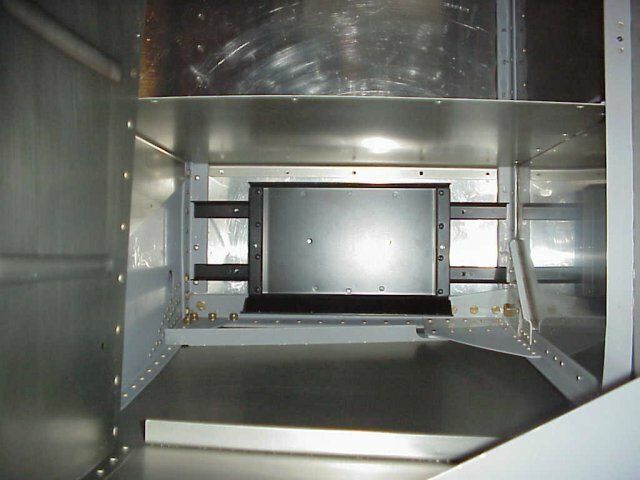 It allows you to put a significant "bubba" in the back seat, and/or to load up the rear baggage compartment and still stay with the CG envelope. However when doing solo aerobatics you would be doing so at the fwd edge of the CG envelope and would experience higher stick pressures. Van's specifies two possible battery locations: the firewall, and behind the rear baggage bulkhead. They specifically recommend the rear location when installing the heavier IO-360, but provide no recommendations otherwise. So which battery location should I go with? Keeps battery out of hot firewall-forward environment — improves battery life. Reduces clutter on firewall — allows better organization of components. 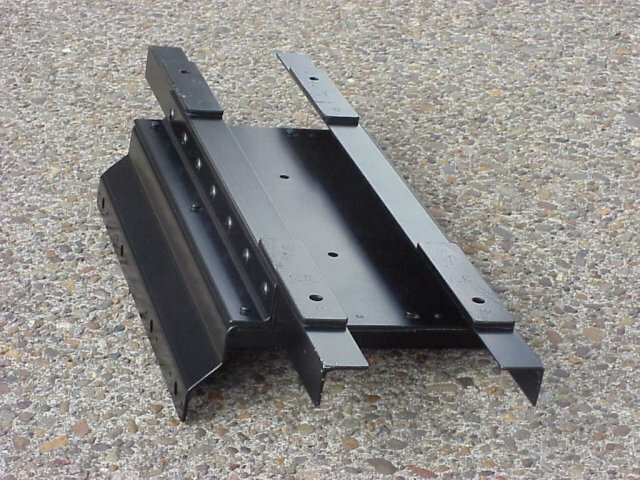 Requires no additional firewall wire penetrations — less chance of leaks, shorts, or weakness. Moves it rearward for a small aft shift in CG — helps with the normally fwd CG bias. I have not calculated the actual CG shift this will cause, but I know it will be in the right direction thus mitigating some of the characteristics mentioned above. I have been told that it will be a SMALL change, but I get all of the other benefits listed above so I have opted for this installation method. 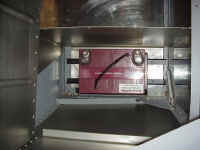 Then I began thinking about a way to mount the battery and make the change possible. See below for the results. It didn't seem like good engineering to just plop the battery on the F-822 floor skin. After all, a 22 lb battery becomes an 88 lb battery in a 4g maneuver! I wanted to find a way to have the load carried by the firewall angles in the front and the F-802G gear box angle in the rear. I ended up starting with the standard battery tray and then designing an undercarriage that both spanned the two structural angles, but also tied into the floor skin. This is how it looks with the battery installed. 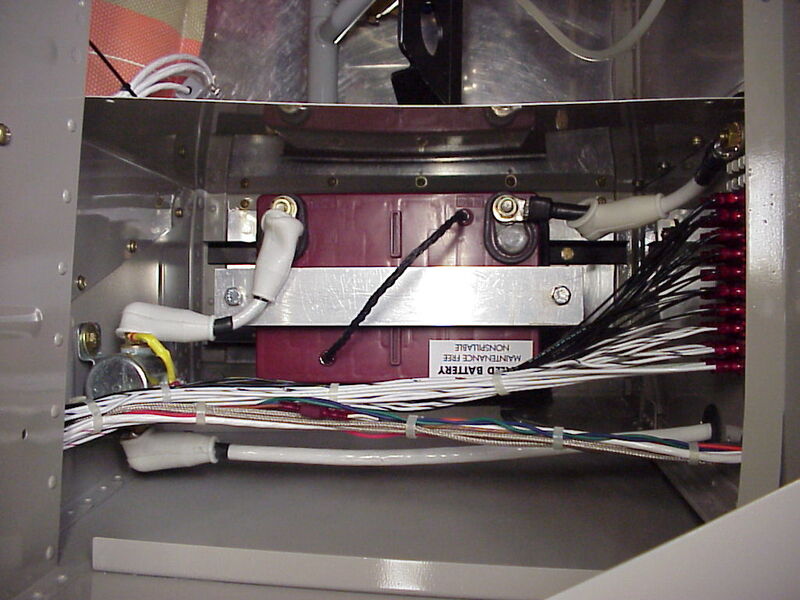 The positive terminal is to the left (aft) and will connect to the main contactor relay which will be mounted on the gear tower. 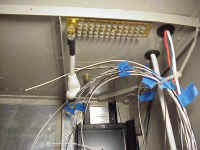 The negative cable will penetrate the firewall and go directly to the starter. 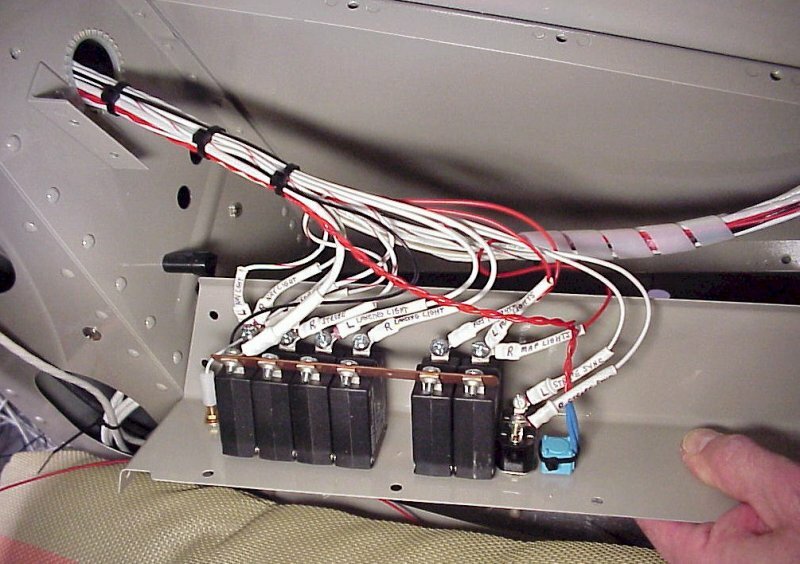 A braided cable will then go from the engine case back to a thru-firewall stud which connects to a ground block on the back of the firewall. Here is my bracket shown upside down so you can see how it also ties into the floor. Those 1/8" shims are riveted on and allow an AN3 bolt to bolt to platenuts that were installed in the F-822 skin BEFORE the bottom skins were installed. Sorry quickbuilders, this wouldn't be possible for you. You could use Rivnuts as an alternative though. 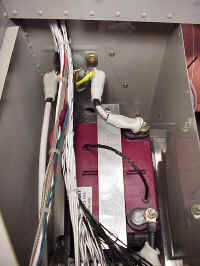 The battery contactor has been mounted mere inches away from the + terminal of the battery on the fwd side of the right gear tower. Note that this is just a few inches away from the main buses on the panel and in the lighting console... short runs. ...and from above when looking down. Most builders dread the prospect of wiring up everything in their projects. For some reason I'm the opposite, I was actually looking forward to it. 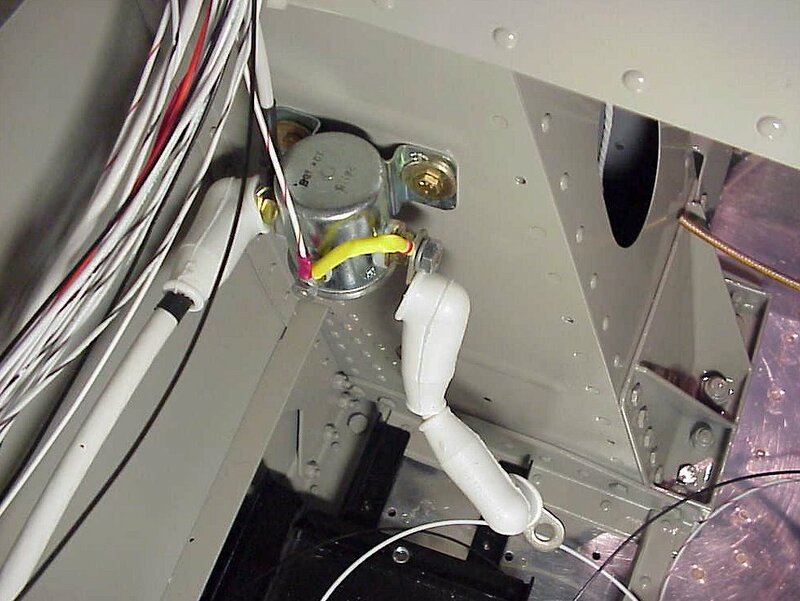 Just like designing your panel, laying out your FWF components, or designing your paint scheme, wiring your plane is a reflection of your own individuality. First off, my overall wiring schematic is a combination of the concepts explained in Bob Nuckoll's book and traditional 40 year old aircraft wiring concepts as manifest in the Van's supplied diagram. Literally, my system is a hybrid of the two taking what I think is the best of both. Specifically, The way Bob recommends routing the alternator output, and using single point ground the system make complete sense. I've had a bit of experience with car stereo years ago and learned the hard way that ground loops are something to be avoided, and single point ground is the way to do it. Oh, regarding what coax cable to use, here's a quote from Bob Nuckolls: "I would recommend RG-400 as the modern coaxial cable of choice. 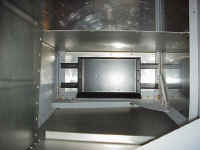 It uses silver-plated double shielding and modern insulations like tefzel. RG-58 is an obsolete specification and no longer controlled for quality. 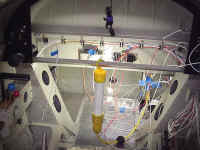 It uses polyethylene and PVC for insulation . . . no longer allowed in certificated aircraft". Yea, I know, it sure looks like a rats nest at this point. But there is a method to all this. If you think this looks bad just wait, it gets worse. I'm a bit fanatic for keeping all wiring runs nice and neat. 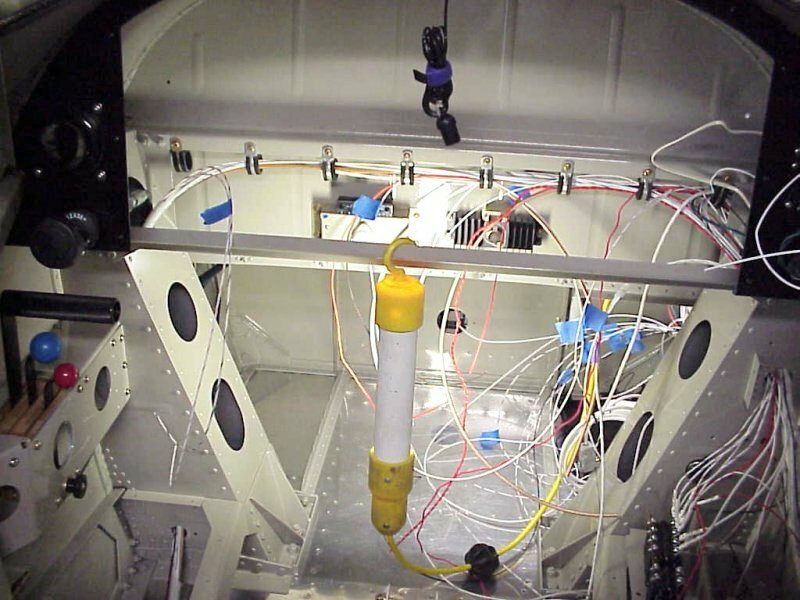 Basically I start at the device end of each line, make the connections, do the labeling, and then pull the wire toward the source until it has exactly the slack, or "service loop", that I want and the wire runs are all tight with no loops. I do that with all wires on a branch and then put 3" sections of appropriately sized spiral wrap on to keep things tidy. Major wire bundles are then secured with adel clamps and #8 screws. Most of my interior panels will be secured with stainless steel #8 hex head screws and washers - a bit better looking than the standard steel variety. Strictly cosmetic, but hey, I have to look at them all the time. Work in progress! 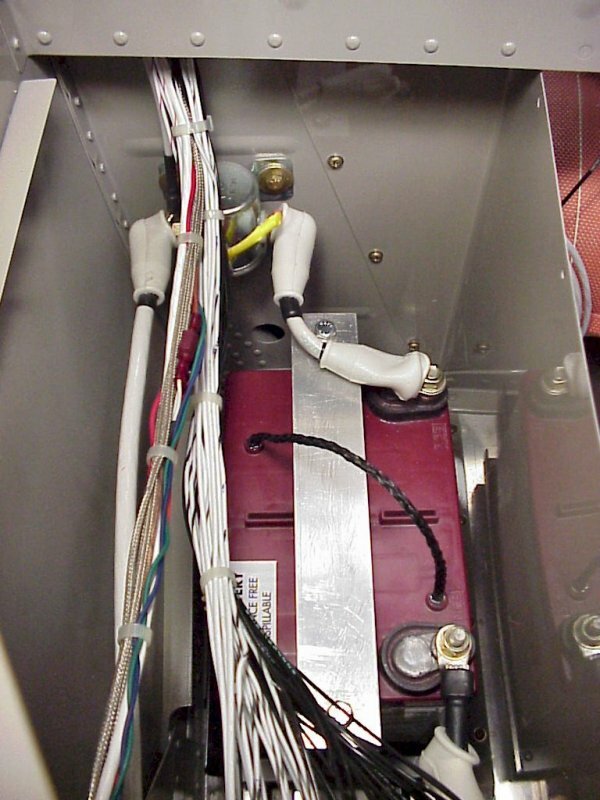 this is the fwd side of the battery compartment showing the single point ground system from AeroElectric Connection. Note the short ground cable, maybe 4", from the battery. 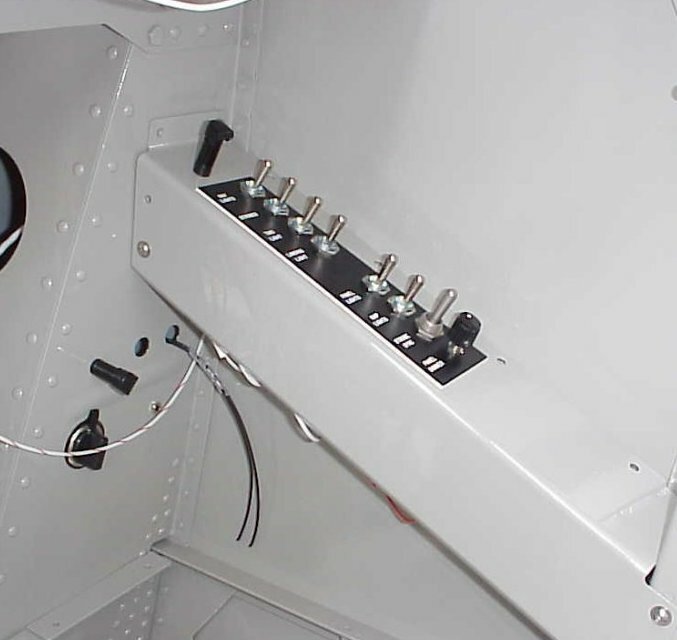 The main ground stud penetrates the firewall, the other side is connected to the ground strap which is connected to the engine case. And here's the end result almost finished. Here's a rather poor picture of my lighting console. 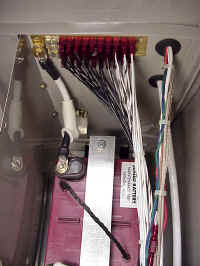 It has the breaker/switches tied together with a copper bus bar the same way I've done on the bottom edge of my panel. You can see that on the Panel page. BTW, the reason there's a gap in the switches is an ergonomic consideration. 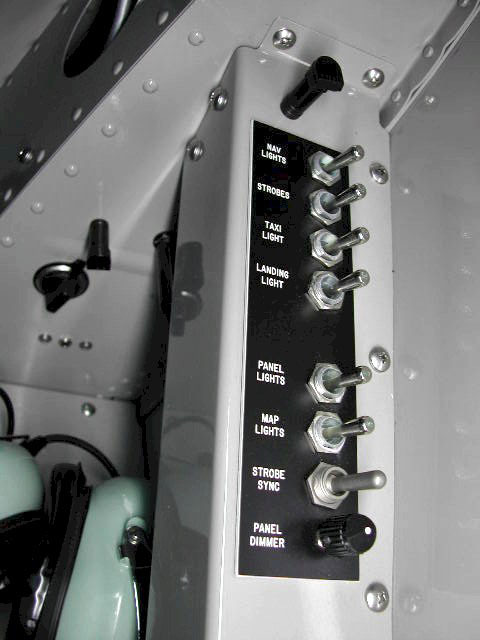 If anyone read Ed Wischmeyer's excellent article on panel design in Kitplanes, October '99 issue, he points out that switches should be put in groups of no more than four so that you can remember what they are without seeing them. Also note the post light at the top of the console, and another one on the gear tower for the headset and music jacks. I tied things back a little tidier than depicted here before I mounted it, but it's essentially done. The bundle continuing back included: ELT wires, pax phones/mic/ent., right rear cockpit lights, and rear aux. power jack.